The WNBA Draft Lottery — Who will select the #1 WNBA Draft pick in 2018? This year’s WNBA Draft Lottery is almost upon us. The four teams that missed the playoffs have a shot at drafting the #1 overall selection in next year’s very deep draft. The four teams that missed the playoffs are the following: Atlanta Dream, Chicago Sky, Indiana Fever and the San Antonio Stars. In order to have the highest percentage of possibly acquiring the #1 pick, teams with the worst 2 year record has the most chances of selecting #1 overall. This year, that honor belongs to the San Antonio Stars. The second worst team is the Indiana Fever followed by the Atlanta Dream and the Chicago Sky. To break it down, although 4 teams missed the playoffs, only 3 teams will be selecting the top 4 WNBA Draft selections. The Atlanta Dream traded away their first round overall pick to the Chicago Sky who will now have two picks in the top 4. The Dream will have to trade in order to get into the first round once again. The WNBA Draft Lottery can go many ways. In 2015 and 2016, the Storm won the #1 picks back to back. This is very rare and difficult to get. Since the San Antonio Stars had the #1st overall pick in 2017, it is very hard to see them getting the #1 pick in 2018 despite having a higher percentage than of the other two teams. In my best educated guess, if I were to guess the WNBA Draft Lottery odds and selection, I would have to say that the Indiana Fever would get the #1 WNBA Draft pick. The San Antonio Stars would get the #2nd overall pick, then the Sky at 3 & 4 overall. Of course, this is just one scenario and it could be a much different outcome when the lottery does take place. This is a WNBA Draft where even if teams do miss out on the #1 overall pick, the rest of the draft has potential superstars, some stars and great potential starters. Teams shouldn’t be too disappointed, but whoever does get the #1 overall pick should help their team and franchise immediately. The San Antonio Silver Stars fell to the Indiana Fever by a final score of 80-63. Danielle Adams led the way for SA with 17 points and 9 rebounds. Shavonte Zellous had 20 points for Indiana. The Silver Stars drop to 9-16 on the season and 3-10 on the road. The Silver Stars next opponent is Tulsa on Friday and the good news is that the Stars only have 4 more road games to play this season, including the one on Friday at Tulsa. My game recap is below, along with game observations and notes. The San Antonio Silver Stars were looking to fix their road problems when they came to Indiana as they were 3-9 on the road this season. However, their road troubles continued as Indiana was able to pull out the victory and improve to .500 at home. The Silver Stars are now 3-10 on the road this season. That wasn’t the last of the Silver Star problems. Already short with their best two players, Danielle Robinson didn’t play in the second half as she injured her right knee during the last minutes of the 1st half. Danielle Robinson was leading the WNBA in assists per game with 6.9 and her status is not yet known. The Fever controlled this game thanks largely in part to San Antonio’s 19 turnovers compared to Indiana’s 12. They also managed to keep players in foul trouble making things even more difficult for San Antonio. Indiana led the first quarter by six 19-13 and built on a 22-12 run in the second quarter due to Tamika Catchings scoring 15 points. They built a 41-25 lead at half time. 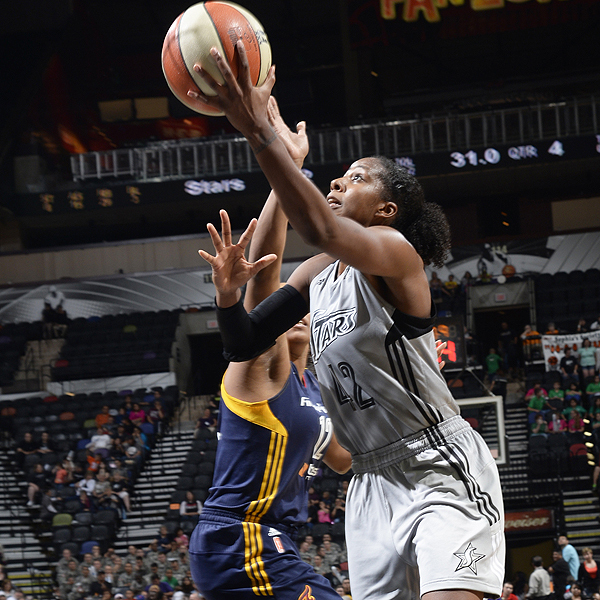 In the third quarter, San Antonio made it interesting when Davellyn White made two threes which cut Indiana’s lead to 44-37. However, IND was able to re take the lead thanks to Shavonte Zellous who was stellar in the second half. She had 20 points in her first game back from a foot injury. San Antonio never recovered and Indiana ran away with the game by a final score of 80-63. I sure hope Danielle Robinson is ok. The Silver Stars are not just the same without her leadership and her ability to run the team. Chelsea Poppens played in her second game for San Antonio. She had 3 points, and was active offensively. She struggles defensively which is to be expected and I thought she was decent. She still has a long way to go before she becomes a good player. This was an ugly game for SA. Not worth watching again for San Antonio fans. The Silver Stars are on the road as they visit the defending champion the Indiana Fever for the second and final time this season. The Silver Stars are coming off a win against the Mercury while the Fever are coming off from a loss at Seattle. The Silver Stars only have 10 games left to play in the regular season and this is the last time they will face an Eastern Conference opponent until Sept 15 which is the end of the regular season against Atlanta at home. The Western Conference playoff race is tightening up and it looks more and more like Seattle will be the final Western Conference team to qualify. However, it is still early and the Silver Stars still control their destiny as they play Seattle two more times and Tulsa 3 more times this season. The Silver Stars are 3-9 on the road while the Fever are 6-7 at home. The Fever currently lead the series 1-0. 1. Defend – The Indiana Fever are known for their defense and the Fever will be itching to play well after three straight road losses. Catchings is a well known defender as is Briann January and Erin Phillips. The Silver Stars must be ready for it and both Danielles will need to be on top of their game for the Stars to steal a road game. 2. Balanced scoring attack – Like last game, the Silver Stars need 4 double figure scorers and they need the bench to play well. The more balanced the Stars are the harder it will be for the Fever to stop them. 3. Get to the FT line – The Fever will make life difficult on the perimeter so the Stars must drive and attack. The Fever are limited in the paint due to injuries so the Stars have an advantage there. They shouldn’t settle for jumpers and look to drive more than they usually do. The game will be on LiveAccess at 6 pm local time, 7 pm EST and 4 pm PST.